To some extent, worn out tires can be used commercially as fuel in cement industry and for making the crumb rubber which can used for making jogging tracks and roads. However, many tires after their years on the road end up in landfills and in stockpiles on the road giving posing a serious risk of health and safety hazards. Through the new marketing campaign, Zeetex is encouraging people to take on greater responsibility when it comes to proper disposal and recycling of used car tires. 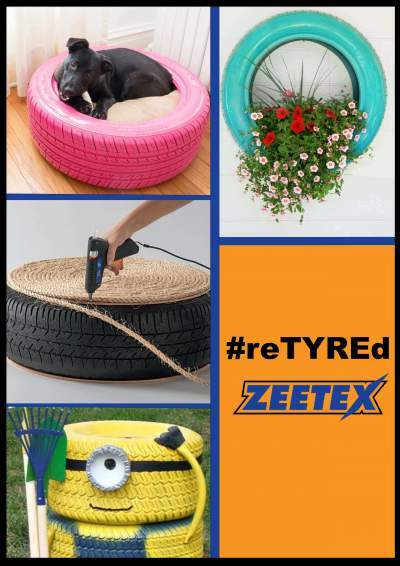 Zeetex is reaching out to its audience on social media through a series of animated posts, with each post sharing a new idea on how to convert used car tires into something that is useful- a series of Do It Yourself (DIY) ideas. Zeetex continues to create an impact by spreading awareness and helping its customers yield maximum benefit out of Zeetex tires even after their life on the road is over. This campaign attests to Zeetex positioning as a responsible brand, yielding positive outcomes for the customers, environment, and the society.